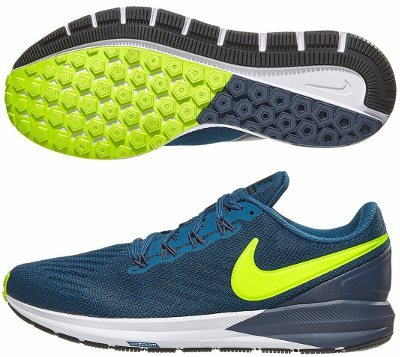 Nike Air Zoom Structure 22 are stability cushioned running shoes. It seems new Nike Air Zoom Structure 22 is not joining latest "revolution" within american brand lineup and current edition does not update to modern and attractive design as popular Air Zoom Pegasus 35 and neither incorporates disruptive foams like React as its bigger sibling Odyssey React does, so it is mandatory to wait for future editions to see interesting changes. There is no big surprise and it is pretty similar to its successful predecessor Air Zoom Structure 21 although major change take place in revamped upper with modern and clean design which reminds spectacular Zoom Fly Flyknit although based on more than acceptable engineered mesh instead of Flyknit and featuring a smaller but reflective Nike logo (Swoosh) moved to rear area. One solution that is still present is FlyWire cables to wrap midfoot for secure and snug fit although amount has been reduced to four elements (in a similar way Zoom Pegasus Turbo does) and are partly hidden by external mesh layer. In order to improve pronation support there is a specific reinforcement in internal side from heel to midfoot for more stable ride. Both midsole and outsole remain the same in current Air Zoom Structure 22 suggesting all laboratory tests and experimental editions with new foams like ZoomX and/or React did not meet minimal requirements for quality ride. As a result of this, Nike decided to keep what was working fine with different densities in midsole for progressive pronation control (Dynamic Support) featuring great stability and smooth transition. Also remains the classical Zoom Air® unit embedded in forefoot to promote a bouncier response. As expected, outsole keeps its honeycomb pattern with multiple lug sizes to better adapt to the ground while lateral crash rail includes several grooves to increase flexibility and traction. Softer rubber (Duralon) is used in forefoot to enhance cushioning while most exposed areas are made of harder one (BRS 1000) to increase durability.